Kitchen | Oh Look! It's A Blog! I need all the coffee. Whenever I look at the pictures I took today I feel like I can ” smell ” them… and I love that. Reminds me of holiday baking and the smells of fresh citrus and cinnamon. 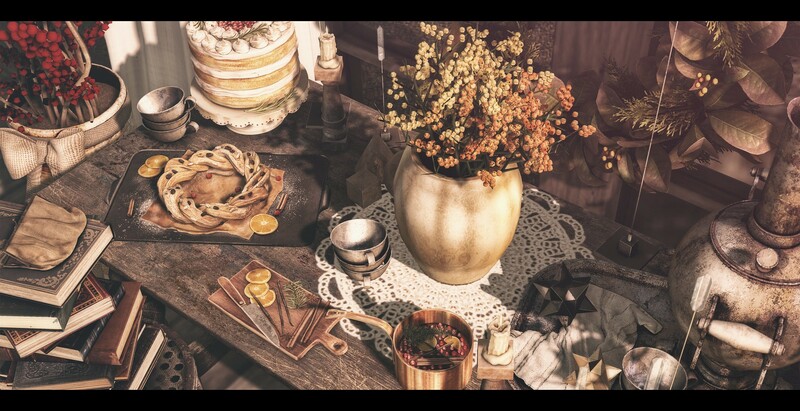 I suppose a great deal of that goes to the realism of the Vespertine items that you can pick up as part of Fameshed Go – The Winter Baking set. I am beginning to think I have an unhealthy obsession with Second Life kitchens. I really love setting up kitchens for some reason, so when Hive released the new “Practical Kitchen” I was itching to make it all cute and lived in. It seems I like kitchens in RL and SL lately, or maybe just pretending to bake in them. I fell in LOVE with the “Disaster Kitchen” set from Random Matter at The Epiphany though and I wanted to do a whole post on it. I recently set up the new Hive skybox at Uber and I am in love with it. The kitchen is built-in (I did mod out the center kitchen island and replaced it with a table) which is great for decorating as sometimes it’s hard to fit kitchens into smaller spaces. ● Hair: TRUTH / Bewkie – VIP GIFT. And I’m still waking every morning but it’s not with you. I have been super busy with all the RL things, but finally getting around to blogging some stuff. Also hoping to catch up a bit. C88 is open again for its newest round. If you haven’t heard, there is also a cam shopping sim – here – that you can try to shop from if the main region is full. I had lots of luck with this method and got in much easier than usual. Addams released a new top and pair of shorts there, which are kinda perfect now that the weather is getting warmer ( for me anyway, I am sick of snow).